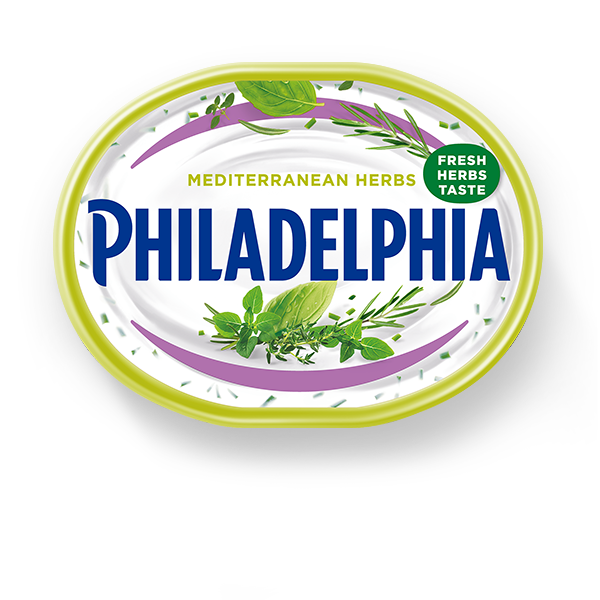 Made with milk and real cream, Philadelphia Mediterranean Herbs has the same fresh and creamy taste as Original and is packed with delicious Mediterranean Herbs - now with an even tastier and fresher herbs taste! Top onto Chicken Breasts and ovencook with a twist of lemon, or spread it onto sliced bread with your favourite toppings for a range of indulgent open sandwiches - perfect for an al fresco meal inspired by the Mediterranean. Philadelphia is fantastically versatile, whether you are looking for an indulgent lunch or delicioulsy creamy dinner. See our recipes for more delicious inspiration. Made with pasteurised milk and with no added preservatives. Suitable for Vegetarians. Full Fat Soft CHEESE, water, rosemary, thyme, basil, chervil, parsley, chives, salt, onion, garlic, spirit vinegar, modified starch, stabiliser (locust bean gum), acids (lactic acid, citric acid), flavouring, white pepper.